It's finally here! After almost one month of translation work, STGBuilder version 0.99.89's fanmade english patch is ready for use! STGBuilder has been, for a decade, a japanese-only software that allowed users to make their own Shoot 'em ups games with a unique interface, entirely used without the use of a scripting language thanks to its complex driven grid eventing system. It has been a success for several japanese doujin games such as Mecha Ritz, Graze Counter, the Infinos series, Kirisame Blade 2, etc. However, this saw a rise of a english community who wants to get hands on this software since many years ago, and today, a english patch rises up from its ashes. Has there any been word from the original author? In the past there were no plans for an official English translation but the latter has been confirmed for the next upcoming STGBuilder version, however, that'll take months. What about the documentation, tutorials, etc.? We're planning to translate that as shortly, but we start with a simple beginner tutorial as a warmup. Stay tuned! YOU MUST USE STGBUILDER VERSION 0.99.89 FOR THIS PATCH. LATER VERSIONS WILL NOT BE CONSIDERED TO WORK! Please do not ask me to make the patches for the latest versions. btw. 2. Download the patch in the link below. 3. Drag the patch files in your STGBuilder directory. The dlls should load the program with patched strings and incorporated japanese locale in it. -The gate numbers in the Script Editor's grid will show properly. -Fixed some typos and translation errors. -Fixed a string error in the Entity Editor's type list. -First version, translation may not be fully accurate so feel free to share feedback! -Nearly ALL the strings have been translated. -In the Player Editor, when you make a new weapon, the default name is created with the japanese string. Not a very troublemaking bug. -Script Editor's translation is partially completed, all the function properties have been translated but the function names aren't translated on the title of the properties + the name width and positions from the grid's panels aren't optimized yet. sc00pj0hn - Project founder, resource hacker, translator. longbyte1 - Programmer, resource hacker, translator. YPwn - Programmer, DLL hacker. Last edited by DrBlowhole20 on Thu Sep 06, 2018 3:57 pm, edited 5 times in total. Lol, apparently i have to fix something for the minor update. I can't wait to try this out. I'll have to play around with it later tonight. It's impressive how fast you guys moved; only a few weeks and this is already in a workable state! Oh, i forgot, i should post my discord server here: https://discord.gg/sBg3Ws7 for those who need support and help, aswell i'll be allowing someone to spot errors in the translation! If I already have a pre-patched file, can I just replace it with the new patched SB.exe, or do I need to patch the original Japanese file? Even without replacing the SB.exe file, it still works since the program saves the program's settings on the registry. In time, this document will get updated as i progress into watching the beginner videos. This might also be a good opportunity to talk with EXA Arcadia about STG Builder with English Patch. Link to PDF is broken. Anyways, good job on the translation patch, I liked it. I always wanted to make a shmup. https://mega.nz/#!3kxHhIIK!ThBjUr4WV5JB ... 3tKvDTlDqM Here's a link to the latest version of my guide. This should do it. And... i have an announcement regarding the future of this english patch. PLEASE READ!!! The development of the fanmaded english patch has been put on hold indefinitely due to STGBuilder recieving minor updates and YPwn currently busy with other projects as i've never ought to speak with him anymore. 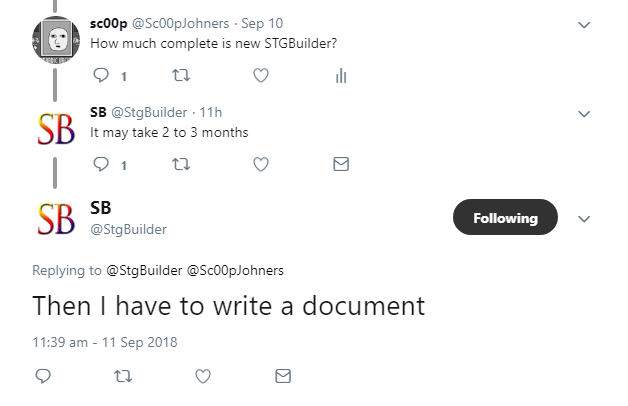 As the New STGBuilder is still on development, i've only tried to get in contact with SB on 13th August, only to recieve the report that development is at around 30%-40%. Considering much time passed ever since i've messaged him, the development may have progressed through 40%-45% ish or maybe even almost the half of completion? As SB will be planning to release the new STGBuilder with a new, refined tutorial/manual, it would be safe to say that i will no longer update the PDF guide due to me losing the focus on using the program, for now. This project was a quite fun thing to do, but for me unfortunately it was a big fatigue. The sad thing is that i will not re-do it for any future versions of the current STGBuilder, so please consider this patch is made for the version v0.99.89. If you want to use the current version with more bug fixes, you'd better be accomodating with the japanese language. Or just wait the New STGBuilder with the refined GUI, which you'll have to wait for several months. I have to say I've appreciated all of your efforts to bring this program to a wider audience. It will be a great resource in the future (hopefully along with the new STGBuilder) for people wanting to dabble in creating games in the genre. You did a great job! The documentation is very helpful as well; I wouldn't have been able to understand what most of these functions do through sheer brute force. The PDF i've made is actually based off the three-parter beginner video tutorials i came across on NicoNico Douga. From what i know, i wanted to finish the beginner tutorial by incorporating the last part of the video series into text, which actually explains a little more about messing around the settings and how to make a boss, but i was too busy with something else so i couldn't bother finishing it. Despite my efforts to bring up a discord server for everything STGBuilder related, i haven't yet soght of a first game done by a non-Japanese user. This explains that STGBuilder's worldwide popularity still need more power. And another good news. By the last time i've contacted SB via twitter once again, a spark of hope has enlightened. It'll be a "mirage" to wait for this, but i'll acknowledge that i could predict for a possible release on December or the start of the next year. We'll see. Patience is a virtue. So I tried downloading STG builder and the 1.02 english patch from your link, but running either the english or the original exe just gives an error saying that SB_DLL.dll and SB_CORE_DLL.dll can't be found, despite them being in the same directory. Any ideas? Place them in the main directory where the program is contained. It is time for the fan-translation patch project to come to an true end soon, because the time has been drawing near. After 11 years, i am proud to state that the waiting is nearly over. SB, the creator of STGBuilder, has opened alpha testing submissions on his twitter for the long-awaited version 1.0, which will definitely mark STGBuilder's true debut to the international community. However, as this is ONLY a alpha testing branch, i'd gurantee that this is not the final build of the game engine and that there is still some time to wait before the public stable release. I would like to wish thanks to everyone who have partecipated and been involved in this project, and that i couldn't have done it without your help. I feel very happy that STGBuilder is finally opening up doors to the international community; and even if you no longer decide to do fan translation, you can still help out in the alpha since you can better provide feedback into more English-friendly user experience. I wish you luck pursuing other things. 11/12 years is really enough time we waited for something like this. I've been trying to spread the word for this so hard, but thanks to myself, the dream has come true. I might be removing the link from my forum signature, as it marks the end of support of the patch. I'd recommend anyone else who sees this to go on and contact SB for requesting the alpha testing, so that we can show the worldwide love for his amazing game engine. Are there any tangible news regarding this? There's been no official announcement concerning the English version and SB obviously does not respond to twitter messages (I heard this from several people who tried to contact him, I also tried myself and there was a wall of silence).